The 8.3-acre Dahlia Square Shopping Center, located in the Northeast Park Hill neighborhood of Denver, Colorado, was developed in the early 1950s. From 1910-1930, the site was home to the Farrey Brick Co. When brick production ceased, former clay pits were filled with construction debris and solid waste. Once the largest African American-owned shopping center in the United States and a dynamic presence in the neighborhood, by the early 2000’s Dahlia Square had fallen into a state of disrepair. With 85% vacancy, a parking lot marred by landfill subsidence, and an increasing rate of vandalism, a community-based redevelopment effort was initiated. However, the landfilled materials, along with other environmental concerns, were an impediment to redevelopment of the property. Brownfield Partners (BP), a company owned by the Principals of RE|Solutions, LLC, was selected by the Denver Urban Renewal Authority (DURA) to purchase, demolish, and remediate the shopping center and provide a shovel-ready site for a mixed-use development. 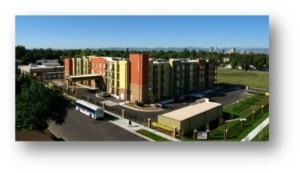 A public-private partnership between Parkhill Community, Inc. (a subsidiary of BP) and the City of Denver, with assistance from the U.S. Department of Housing and Urban Development, the Colorado Housing and Finance Authority (CHFA) and EPA, deployed a financing package using grants, general funds, and loans to fund the site restoration. The cleanup and regulatory closure was achieved in just over a year. The site’s redevelopment includes the Park Hill Family Medical Center and the Dahlia Square Senior Apartment complex, with approximately 170 affordable senior residential units.